Bro. 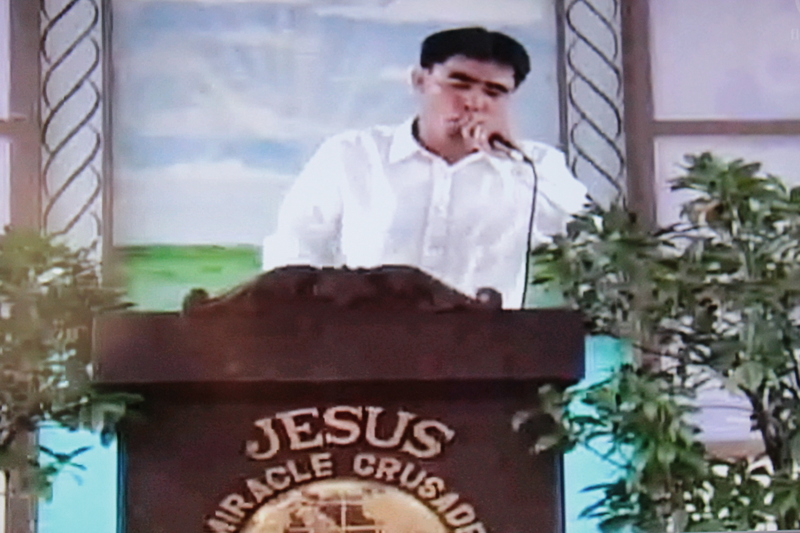 Boy Manguera testifying during JMCIM Sunday service at Amoranto Stadium, Quezon City, Phils., Oct. 2011. Brother Boy Manguera, a preacher of the JESUS MIRACLE CRUSADE INTERNATIONAL MINISTRY, was in tears as he thanked and exalted the name of the Lord Jesus Christ in his latest testimony. He was weeping in awe, amazement, and deep gratitude as he related the recent miracle that happened to him. At dawn of Monday (October 3), just after the victorious celebration of the 11th Mindanao Peace Mission Anniversary and Thanksgiving Crusade, Bro. Boy, together with the other preachers from around the country, was sitting on a chair inside our beloved Hon. Pastor Wilde E. Almeda’s tent on the stage of the Quirino Grandstand in Luneta. Then without minding his surroundings, Bro. Boy leaned back not knowing that the place where he was sitting had no barrier except a curtain, and so suddenly, he was on a free-fall. He fell backwards from a height of more or less ten feet and landed on the concrete floor head first. He testifies that although the impact was so strong, he didn’t feel anything. He sustained a large gash on his head from which copious amount of blood spurted. But all the preachers did not delay in rushing to where he was lying and all-together prayed in faith with power and authority. After the prayer, the flow of blood instantly stopped and Bro. Boy was brought to a clinic where his wound was sewed up. Miraculously, he was well after his horrifying fall. Halleluiah! Bro. Boy used to live in depravity, going out with evildoers and wallowing in vices. Because of this, he acquired sicknesses and diseases such as weak lungs and acute ulcer. He had no hope of a new life, but one day in 1986, he found the Lord Jesus Christ in a crusade of the Jesus Miracle Crusade Int’l. Ministry. That day, he received the Lord Jesus in his life as his Lord and Savior, was baptized in water in His name, and surrendered his life to Him. His life was completely changed and all his diseases were healed. He became a preacher of the Church, and together with his whole family and relatives who were also saved later, pioneered the outreach in Lemery, Batangas. Their hard, miserable life before was blessed abundantly by the Lord. In 2007, Bro. Boy’s faith was tested when he became sick of gallstones. He could no longer eat and so, he lost a lot of weight. He also couldn’t sleep for almost three months. The doctor who diagnosed him prescribed many medicines that he must take daily and advised that he must undergo immediate surgery. He was warned that if he wasn’t operated on immediately, he might die in just four months or become comatose. But Bro. Boy refused surgery and also didn’t buy any of the medicines. He knew that his sickness was just “a reminder” from the Lord for he had been contemplating giving up preaching. He knew his plan wasn’t the will of God. He sought counsel from the house of our beloved Hon. Pastor Wilde E. Almeda and he was told that he was called to preach and should never turn his back from God’s holy calling. Right then and there, Bro. Boy vowed to the Lord that he would go back to preach the Gospel with boldness. Instantly, he felt relief and was able to eat well and sleep soundly. He obtained complete healing without surgery or medicines! 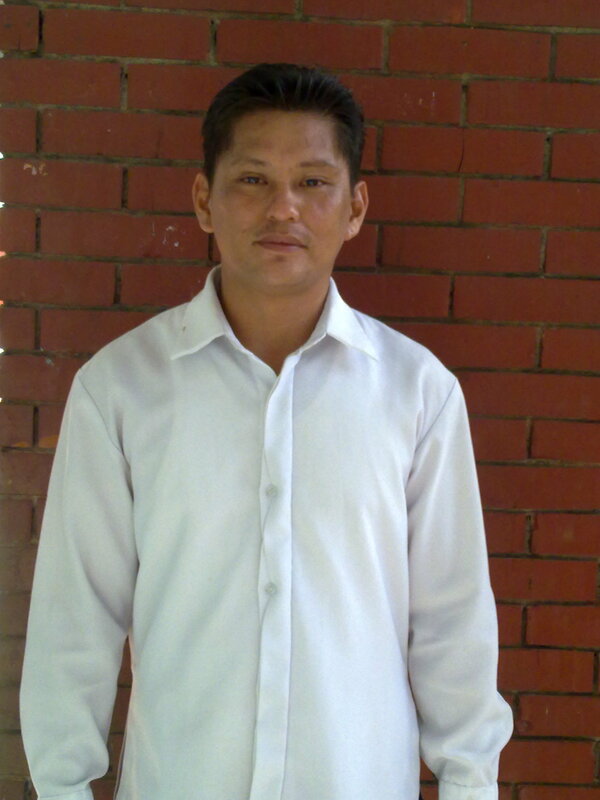 To my beloved brethren-in-Christ, I included the recorded Tagalog testimony of Bro. Boy Manguera below. I pray that you will share it with others also. Sis. Amy Manalansan at Amoranto Stadium, March 2011. Over 20 years ago, Sis. Amy Manalansan had surgery in her right kidney. But after this, a lump developed under her arm. Though she took medications for her ailments, she became weaker every day. Her family decided to sell a property so she could go to Europe and find healing there. So, she traveled to Vatican City, collecting water from the fountain there believing this would heal her. She bathed in the “holy waters” in France, because she had heard that these waters could heal. After she came back from her travels, bringing with her bottles of “holy water” that she took from those foreign lands, she found out that her disease had spread to her other kidney and needed immediate surgery. The lump under her arm, which did not disappear after her travels, was also removed though surgery. After the lump was removed, another one developed, and it was bigger than the first. She took medications to dissolve this, but instead, she developed ulcer in the process. When she moved out, there was fresh blood in her stool. After the two surgeries that she had on her kidneys, her condition did not improve: she still couldn’t urinate normally. With the ulcer that added to her suffering, Sis. Amy developed insomnia. And with this, she also had to take pills to be able to sleep. With kidneys that weren’t functioning well, a big lump under her arm after the first surgery, ulcer and insomnia – her doctors couldn’t assure her of healing. One day, just barely two months after her surgery under her arm, she was running a high fever, and she was feeling pain from her kidneys, stomach and armpit all at the same time. No longer able to endure all the pain and suffering, she threw herself on the bedroom floor and begged God to end her life. But she had one last request: that God would show her the true Chruch where she could really know Him and serve Him with the remaining days of her life. She was crying profusely. After this, she padded to their living room and lay on the couch. Then she heard a whisper telling her to open the TV, which she did without hesitation. The TV program of the JESUS MIRACLE CRUSADE INTERNATIONAL MINISTRY came to view. She felt a rush of cold wind enveloped her and she wondered, so she sat and began to listen to the testimonies of healing and lives changed. She noticed that she was sitting upright for a long time, and felt relief spreading all over her body. Her fever left and all her pains slowly subsided until she couldn’t feel any pain or discomfort anymore. When the Jesus’ Finest Generation Choir began to sing, she felt like she was floating in her seat. She also saw that the choir seemed to float in the air. She was sobbing uncontrollably all this time. She felt that she had been healed from all her diseases. In her exceeding gladness, she stood to embrace the TV, wondering what had happened to her. Sis. 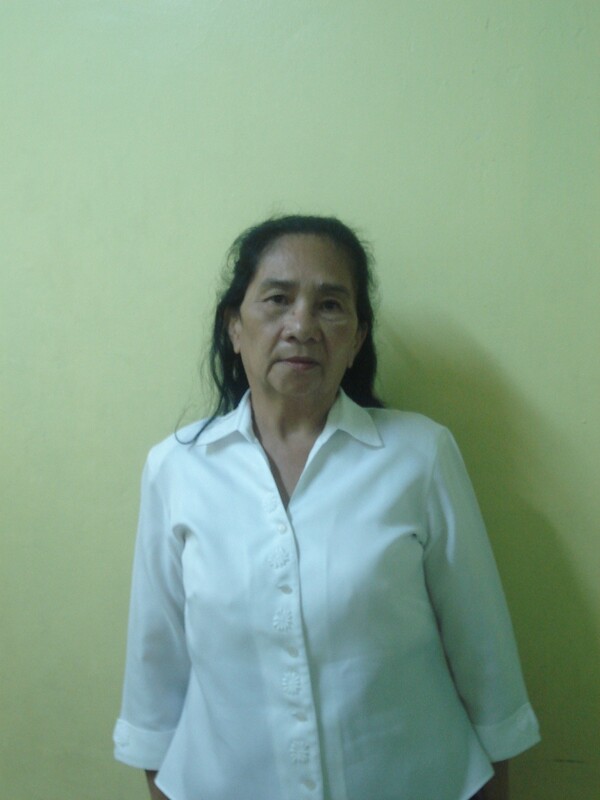 Amy received Jesus Christ in her life, was baptized in water in His name and served Him faithfully in JMCIM, and continue to do so to this day. It has been 20 years that she received complete healing of all her diseases and had not tasted a single medicine ever since.